Bingham Senior Mitch Doman with his buddy. The average Bingham students spend their Thursday nights attending sport events, doing homework, or catching up on the latest episodes of their favorite television shows, but some students are far from average. 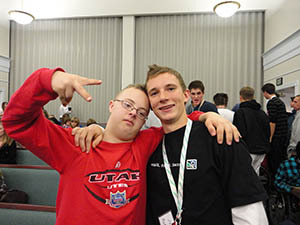 Students attend the South Jordan Special Needs mutual, or meeting, where volunteers have the opportunity to help a person with special needs for the night. The volunteers’ goal is to become their best friend while listening to them and making a safe and fun environment. The program is similar to the Best Buddies program, because students, some of which attend Bingham, have the chance to help a person with special needs. High school students without special needs have the official title of “friend” and are assigned to a youth member or simply a “youth.” The program is split into two sections: the young women and the young men. Because the mutual has sixty-six youth at its fullest, friends play an important role. Phil Hansen, a teacher in the program agrees that friends are important to the youth. According to Chris, the affect that friends can have on the youth is powerful. The youth can have someone that will be there and that cares. Having that person can be comforting to them. “She likes me and knows me,” said Madeline, a youth in the program. Friends like T.J. are recommended by the program’s leaders. Each friend selects who they will help in a preliminary meeting, where friends are told about the youth they have selected. A friend’s assignment is to care for their youth. They supervise them, help with activities and keep them entertained. In addition to providing for the needs of the youth, the program also benefits the friends. “This help students realize that life isn’t so bad, that they can’t complain,” said Jared Denslow, a teacher in Bingham’s Special Education department. Phil said that the program has a powerful effect on the friends. Because it is based in South Jordan, many Bingham students are heavily involved. However, students may find it difficult to keep up with athletics, schoolwork and other responsibilities. Some have dropped out of the program because of school or family obligations, but people that have a busy schedule usually decline the offer. Junior Tonia Evenson, who just joined the program, has a hard time balancing lacrosse and the program. Her practices run till six thirty, giving her thirty minutes to get ready and arrive. “It’s hard but it’s worth it,” said Tonia. Senior Nate Hannay was chosen as a buddy last year. He had to do most of the talking because his buddy did not talk as much. He said it was awkward because Jason, his buddy, felt uncomfortable speaking with him. Not all of the participants are shy or have a difficult time with speech, but this program helps those that do to socialize and have a person to trust. In other cases, friends and the youth are unable to communicate verbally and have to resort to other means. In these cases friends use the emotional reactions of their youth. In overcoming these problems, the program takes an individual approach. “Because they communicate at different levels, we’ve tried to focus on the individual,” said Kelvin Anderson, President of the program. The program was started in the 90’s because the needs of the youth were not fully met in other activities. The current program was formed in 2003 because of an overflow in the previous activities. This meeting allows youth twelve and older to join. However, friends must be sixteen or older to participate. The mutual will continue to reach out to those with disabilities and Bingham will continue to provide students willing to participate.